The program verifies the input structure using the method of dependent pressures or using the spring method according to JGJ 120-2012. The load applied to the structure is derived from its deformation, which allows to realistically model its behavior and provides cost effective designs. The analysis correctly accounts for the construction process such as individual stages of progressive construction of the wall (stages of constructions) including gradual evolution of deformations and post-stressing of anchors. Program can model any kind of braced sheeting too. The use of the method of dependent pressures requires determination of the modulus of subsoil reaction, which is assumed either linear or nonlinear. The program also allows the user to check internal stability of the anchorage system. The actual analysis is carried out using the deformation variant of the finite element method. Displacements, internal forces and the modulus of subsoil reaction are evaluated at individual nodes. First, the nodes are inserted into all topological points of a structure (starting and end points, points of location of anchors, points of soil removal, points of changes of cross-sectional parameters). Based on selected subdivision the program computes the remaining nodes such that all elements attain approximately the same size. 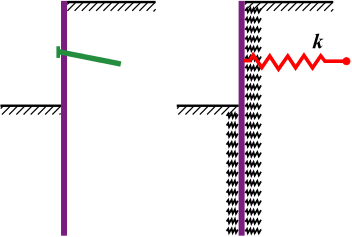 A value of the modulus of subsoil reaction is assigned to each element - it is considered as the Winkler spring of the elastic subsoil. Supports are placed onto already deformed structure - each support then represents a forced displacement applied to the structure. Hurych, P.: Metoda zavislych tlaku. Sbornik konference "Automatizacia projektovania", Vysoke Tatry, 1978.